Marigolds are pretty little flowers that are great to have in your garden for a whole host of reasons! Don't be fooled by the sweet little marigold - it is a powerful little plant that can either help or hinder your garden! Marigolds are best known to be a helpful plant in hindering the angry nematoad, and has been used regularly by vegetable gardeners everywhere to deter them. Unfortunately this only works if you plant your marigolds with pounds of marigold seed in a thick blanket with your veggies, and they only repel certain types of nematoads. If you are determined to use the marigold as a deterrent, another great tip is to plant your marigold in the summer, let them grow for a solid two months and then chop them all down. Then you can turn the roots under into the soil- this method works extremely well to nip your nematoad problems in the bud! pot marigolds (calendula officinalis) are medicinal, beautiful, and will help keep the aphids away from your roses and tomato&#x27;s! I had no idea about this! For many years, I would just plant a few plants - clearly now only for color, not as a deterrent! I have fond memories of marigolds though - when I lived in Canada as a child, I found one in a public garden that was HUGE and I was delighted to claim it as mine. Evidently I told everyone who could hear, &#x27;I didn&#x27;t pick it!&#x27; I had gotten into trouble for picking other flowers at inappropriate times! I really don&#x27;t like the look of marigolds- is there something wrong with me? earthworm, what about calendula officinalis? 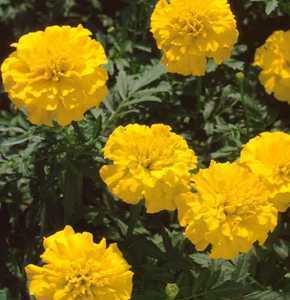 This plant is gorgeous and doesn't have the 'buff ball' look of the other hybrid marigolds. I have to check out the difference between the two. I didn't know there was one!